LA Schools Superintendent Steps Down, Defends Tenure : The Two-Way John Deasy's resignation, announced by the Los Angeles school board Thursday, comes after high-profile tussles with the teachers union and a troubled initiative to put an iPad in every student's hand. 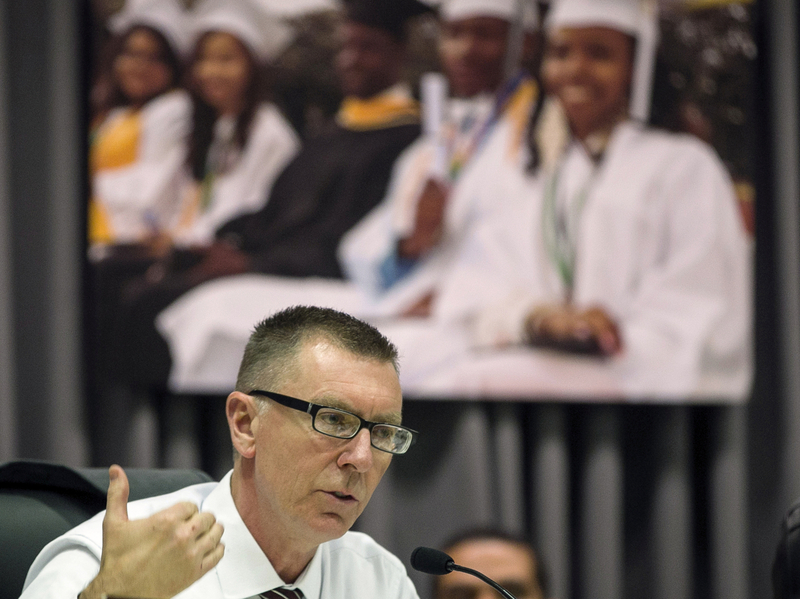 Los Angeles Unified School District Superintendent John Deasy, seen in a photo taken last year, says his resignation Thursday was "by mutual agreement." Los Angeles schools Superintendent John Deasy has stepped down as head of the nation's second-largest school system after a controversial tenure that saw him at odds with the teachers union and unable to push through a plan to get an iPad in every student's hand. His resignation was announced Thursday in a joint statement by Deasy and the board. It was also announced that former Superintendent Ramon C. Cortines would return to head the district starting Oct. 20 while officials search for a successor. Although Deasy will say only that his resignation was "by mutual agreement" with the school board, in his first interview since the announcement, he acknowledges on NPR's Morning Edition that his leadership style could have played a role in the decision. "I certainly am responsible and consequential for my style of leadership and my agenda, which was students' rights first," he tells host Steve Inskeep. That agenda, he says, "definitely made some adults uncomfortable." Deasy, 53, nonetheless defends the achievements of his 3-1/2-year tenure. "It was a historic period of time, unlike any other in the work of LAUSD [Los Angeles Unified School District], where achievement rates were the highest they had ever been," he tells Steve. "Graduation rates moved from the upper 50s to 77 percent, a historic high. Every indicator, actually, had never been better." He points to his initiative to end what he calls "the criminalization of students" by reducing suspensions from 48,000 a year to fewer than 8,000. But Deasy rejects charges that he didn't fully respect teachers: "I think teachers, from day one, have been at the heart of why we saw the improvements," he tells Steve. "The board, at the end, was really — did support a lot of the work. Though, I think my pace and the way I went about it is very open to critique." Asked whether there's an implied time limit to make reforms for leaders in big city school systems, such as himself and Chancellor Michelle Rhee, who was forced out as head of Washington, D.C., schools in 2010, Deasy says it's "a worrisome trend in America. "I think we're watching that happen. It does concern me. I think there's always the delicate balance of how slow you're willing to go, and then you have to square that with looking youth in the eye and say, 'Well, it's not your turn this year,' and that's difficult to do." Although his $1 billion iPad initiative floundered partly over problems with vendors, if his departure spells the end of the project, "we're doomed," says Deasy. "If you walk around any Korean school you would realize ... [that] we [in the United States] have a long way to go if we're going to be competitive internationally." He said criticism of the iPad plan was baseless and politically motivated. "I think this is another emblematic issue — when you direct resources solely to students, that means those resources are not available to go to adults. And I believe that that was part of the issue that took place in this case," he says.